Median neuropathy is often thought of as only being carpal tunnel syndrome or entrapment of the median nerve at the wrist, but the condition can also affect the forearm and elbow. As the median nerve exits the brachial plexus in the upper arm and extends past the elbow, it lays in a superficial position just behind the bicipital tendon aponeurosis and anterior to the brachioradialis muscle. 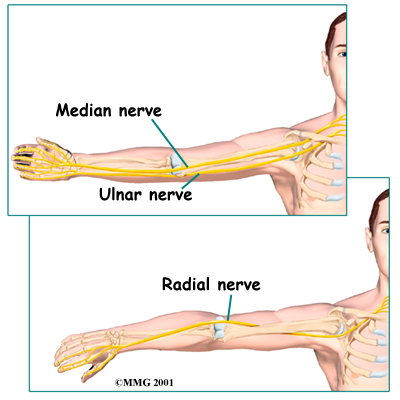 The medial nerve then passes between the ulnar and humeral heads (upper arm bone) and the larger bone of the forearm. It then traverses the pronator teres muscles. At this point, the anterior interosseous nerve (which is a motor nerve only) branches off and if it is compressed in the muscle or injured by a traumatic injury, the muscles affected in the forearm will manifest as an inability to flex the last portion or distal joints of the thumb and index fingers. If the anterior interosseous nerve is affected, patients will often complain of inability to pick up small objects. Anterior interosseous syndrome is also referred to as Kiloh-Nevin syndrome and is relatively rare. It may be a difficult diagnosis to make, as it often presents with arm pain that is diffuse and can present as radiating pain to the elbow or even pain radiating down further into the wrist or hand. If the median nerve is compressed before the anterior interosseous nerve separates, it usually occurs between the two heads of the pronator teres muscle. It may also occur while in the bicipital tendon or in the flexor digitorum muscle. Trauma to the biceps tendon resulting in swelling or bicipital radial bursitis or a partial tear of the biceps may result in irritation of this nerve. If the median nerve is compressed at the wrist, as in the carpal tunnel, it presents as sensory symptoms in the first three digits of the hand. If it is more progressed, motor problems involving these digits can be affected. Carpal tunnel syndrome is the most common presentation or disorder of the median nerve. Less common anatomic variances occur where the nerve presents with a different denervation pattern to the fourth and fifth digit; however, even in normal presentation patients may complain of non-typical patterns of sensory or motor symptoms. They may complain of proximal symptoms of diffuse arm pain or even pain radiating up to the elbow from compression at the carpal tunnel, making it a more confusing diagnosis in atypical cases. Classical carpal tunnel syndrome is much easier to diagnose. Surgical intervention may be required if the condition does not resolve itself. If you continue to suffer with median neuropathy and your current treatment plan leaves you feeling hopeless, perhaps a fresh set of experienced eyes can change your outlook. Since 1990, Dennis M. Lox, M.D has applied his personal interests in sports medicine, cutting-edge regenerative medicine and chronic pain management to helping patients increase their quality of life. Contact us for an appointment at 727-462-5582.